Screenshot from Okinawa Digital Archive. April 1, 2017 marked the seventy-second anniversary of the start of the Battle of Okinawa, when American forces landed on the island of Okinawa during World War II. The nearly 290,000 American soldiers who took part in the invasion of Okinawa were opposed by 150,000 Japanese troops. This was the first and only time American soldiers fought on Japanese soil. More than 20,000 Americans  would be killed during the Battle of Okinawa, while the Japanese military dead would top more than 100,000 . During the battle it's estimated 150,000 Okinawa civilians , out of a pre-invasion population of 300,000, were also killed by both Japanese and US forces. Okinawa would be administered by the United States until 1972. The island served as a major American base during the Vietnam war, and the American presence in Okinawa continues to this day. Of Okinawa's 1.4 million residents, more than 100,000 are Americans  — mostly military personnel and their dependents  or Department of Defense civilian employees. On the seventy-second anniversary of the Battle of Okinawa, Japanese researcher Hidenori Watanave has made a variety of Twitter posts that feature archival photos of the battle that have been colorized using a software tool  created by researchers at Japan's Waseda University. 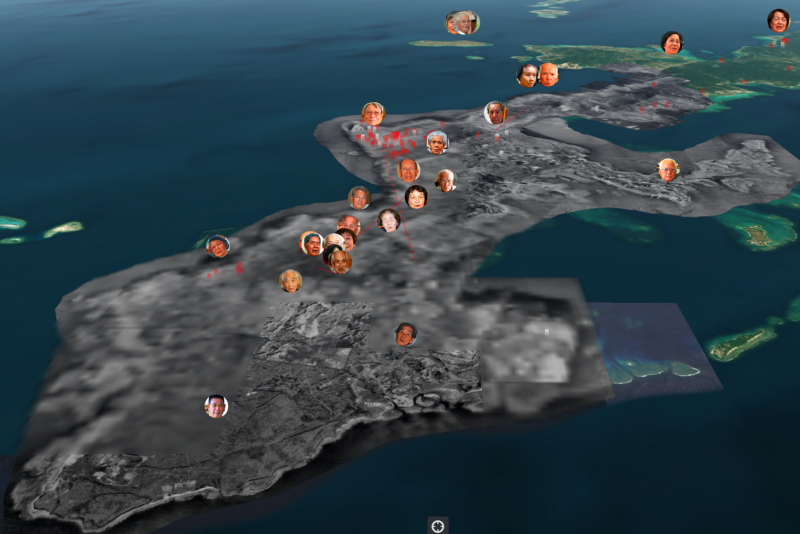 Watanave has spearheaded many innovative online mapping projects, including mapping the oral history  of the Japanese attack on Pearl Harbor  on December 7, and an interactive map of the Hiroshima  and Nagasaki  atomic bombings. 72 years ago today marks the start of the American landings on the island of Okinawa. The landing beach as seen from land. Image colorized by neural networks. Many of colorized photos of the Battle of Okinawa Watanave has posted on his Twitter feed are from the Okinawa Digital Archive , an online mapping project that, like Watanave's other projects, places photos and eyewitness testimony on a map. 72 years ago today marks the start of the American landings on the island of Okinawa. The mouth of the Hija River (the site of the main American landing ) is at the center of the photo. Yomitan Airfield is on the left. Image colorized by neural networks. In the case of the Battle of Okinawa, Watanave tweeted photos on the date on which they were taken 72 years ago. 72 years ago today. In a photo taken 43 minutes after the landing, an amphibious tank is stopped on the shore of Yellow Beach. Image colorized by neural networks. The photos provide a concrete perspective on what was happening during Battle of Okinawa. 72 years ago today. American forces at Yomitan airfield on landing day. American armored units make their way (inland). Image colorized by neural networks. 72 years ago today – Kakazu Ridge, in an image taken on April 9, 1945. Kakazu Ridge would mark the start of the fiercest fighting of the Battle of Okinawa, where at least 64,000 Japanese troops would die and 24,000 Americans. Watanave has also colorized some spectacular photos, such as the sinking of the battleship Yamato, at the time the largest ship ever constructed . 72 years ago today. The battleship Yamato under aerial attack on its way to fight in the Battle of Okinawa. 72 years ago today. April 7, 1945. Yamato, the largest battleship in history (to that point) is sunk in the seas south of Kyushu by scores of torpedoes at 2:20 PM while en route to the Battle of Okinawa. Watanave's Twitter feed also features colorized photos of the aftermath of the war. 72 years ago today. At Yomitan airfield on Okinawa, American troops inspect Japanese war materiel destroyed during a surprise attack. The Battle of Okinawa also saw civilians experiencing great cruelty at the hands of American and Japanese forces. Watanave's Okinawa Digital Archive documents such civilians experiences of the battle and can be explored at okinawa.mapping.jp . The book Descent into Hell: Civilian Memories of the Battle of Okinawa  by Okinawa’s Ryukyu Shimpo newspaper is also a good resource for these stories. Explore testimonies, photographs and just where people died during the Battle of Okinawa. American forces landed seventy-two years ago today (April 1, 2017), so please take a look. As well, anyone can use Waseda University's neural network-based automatic image colorization tool here .